Google continues to strengthen its position as market leader in search engines by enhancing its Google Book Search service. 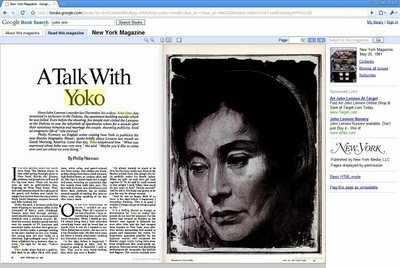 Besides books, Google scans, OCRs and other digitalized reading materials, avid readers of Magazines can now make use of this search tool from Google to look for millions of articles extracted from magazines. Currently Google is collaborating with a handful of publishers and authors such as Building Systems, Popular Mechanics, Ebony, Popular Science, Prevention, New York Magazine, Jet, etc. 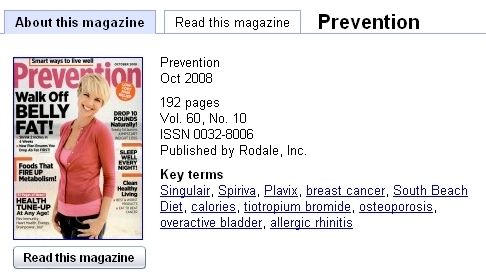 Users can use Google Book Search to look for articles available from the associated magazines. The articles are not limited to current issues but also backdated issues digitalized by Google and are available to be read in full color and in its original context. Besides searching for articles, users can also click on to “Browse all issues” to view issues from across the decades. Google has created a summary for each issue, e.g. number of pages, publisher name, contents, etc for users’ easy reference. Google stated that more and more magazines will be added in time to come to make this service more attractive. This is a great attempt by Google to make information and knowledge more accessible to the world by digitalizing historical data. While this may seems like an exaggeration, magazines do capture a piece of history as a way of understanding the perspective of the day.